Sat March 9th, Doors 10 pm, 19+ ID required. 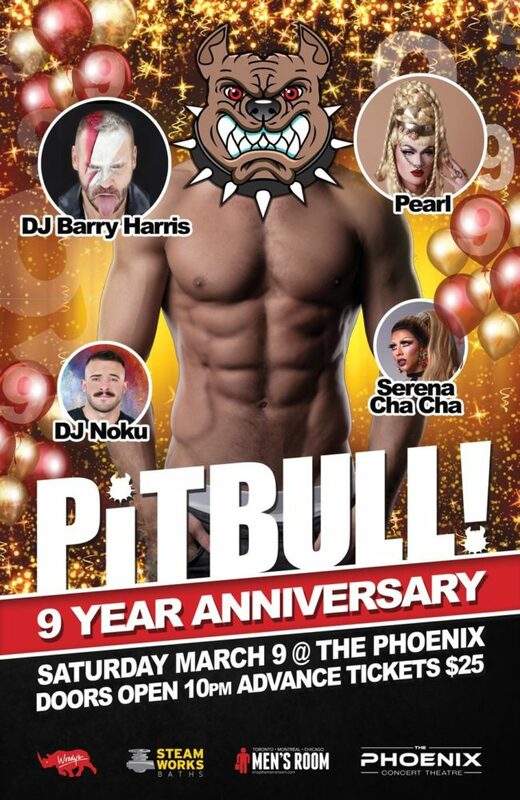 9 full years of incredible parties have all led up to this one insane night – Pitbull 9 Year Anniversary is happening March 9th and you’re not going to want to miss it!! World class DJ’s and Queens, an amped up light and sound system and surprises throughout the party will keep you moving and sweating all night long! Legendary DJ / Producer Barry Harris (Thunderpuss 2000) will keep the dance floor packed with the hardest beats that can be served after Toronto superstar DJ Noku gets the party started with an incredible opening set. The sensationally beautiful Naomi Smalls (RPDR All Stars 4) returns to Pitbull after her insanely successful Toronto Pride appearance to destroy the stage with multiple shows. Grab all your friends, get your tickets and get ready to have an unforgettable night! !